The new 3DS Circle Pad Pro has been revealed by Nintendo of Japan. 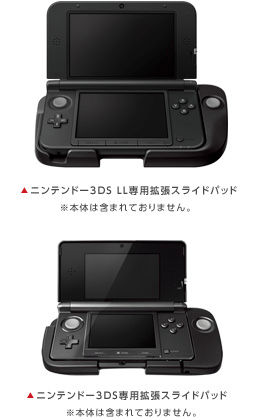 The home office has an image showing what it will look like on the expanded Nintendo 3DS XL. Based on the image, the new model of the Circle Pad Pro will be more ergonomic than the previous model. Several gamers were concerned when Nintendo announced the new 3DS model earlier this summer, larger than the original model and sans second circle pad. Nintendo tried to alleviate those fears, promising a larger Circle Pad Pro for those that prefer it for games like Metal Gear Solid 3D: Snake Eater and Resident Evil Revelations, to name a few. As of today’s announcement, those fears should be all but gone. Currently, there is no release date or pricing for the new Circle Pad Pro. However, given the price for the last version, expect it to be at or just above $20 when it comes out in North America.